Bring on the power! 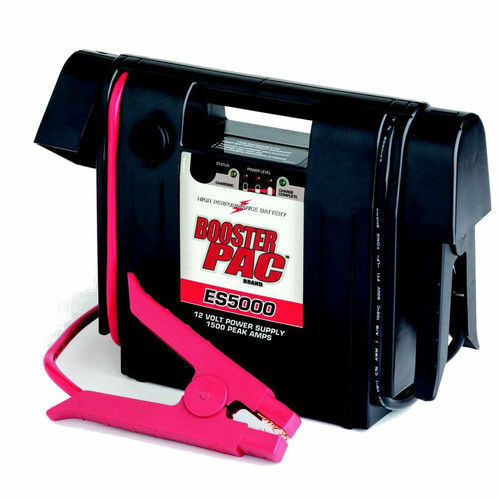 With a high performance battery and up to 1,500 peak amps, the Booster PAC ES5000 12V 1,500 Amp Battery Jump Starter is perfect for professionals who need serious starting power. Multiple jumps between charges and 43 in. cables make the ES5000 as convenient as it is powerful. 1,500 peak amps. 400 cranking amps. ES Series battery designed specifically for vehicle jump starting. Automatic recharging. LED battery status indicator. 43 in. #4 AWG cables. Industrial Grade Hot Jaw clamps. DC outlet to power 12 Volt accessories. Congratulations, you have found descriptions, reviews, prices, and availability for Booster PAC ES5000 12V 1,500 Amp Battery Jump Starter. Our crawler software prepared this page for you while searching for "Starters" and related Auto Parts products at Walmart. If you have any questions on this product, please give us a call at 734-971-1210 during the hours of 9am - 5pm EST for assistance. Thank you for shopping at Tbook.com, the Internet Department Store!